A walking and riding weekend. Another active weekend was had on 17th/18th June. This weekend started with the LDWA Poppyline walk, which we almost missed out on as it filled up quicker than expected, but lucky for us I know the right people !!! This time Jayne was able to join Gina Jo and myself, so on the hottest day of the year so far we found ourselves walking 18 miles from Sheringham. As usual, the route did not disappoint with sea views and parkland. We have now done all 3 LDWA challenge walks. Many people run walk these events and it’s something I would like to try sometime in the future. Once again it was another very hot day and for once I was happy that we had decided to do the shorter route of 50 miles although riding from home made it 65 miles. There was a huge gathering of SWNC riders at the start, then we all split down into our little groups. 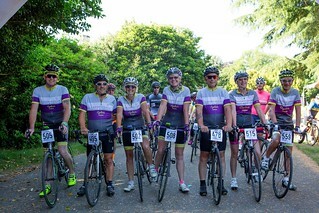 After the very hot but enjoyable ride, we gathered with other riders in Parkhouse garden enjoying ice cream, hot dogs and shandy before a gentle ride home. This entry was posted in LDWA, Personal, walking on July 15, 2017 by Sally. Its been a while since I did some real walking, I am usually put off due to the amount of travelling and cost, but yesterday I dusted off my walking boots, made the effort and was not disappointed. 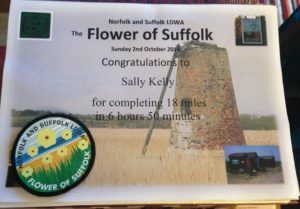 The day started with a 2 hour drive to walberswick ,in pouring rain with Jo,where we met up with Gina and Jayne to walk The LDWA challenge walk ,the Flower of Suffolk, in the past Gina and I have walked the Daffodil Dawdle 26 miles and Jayne well she has now done 13 of the 100 mile events, while this was going to be the first taste of a challenge walk for Jo. Luckily by the time we had met up,picked up our route sheet had a quick chat and coffee the rain had stopped and the sky was brightening up. Although I can follow these walking routes, as we are chatting a lot !! 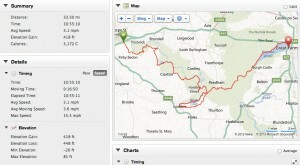 it’s easy to lose your place so I decided to put the route on my garmin 1000 as a back up. 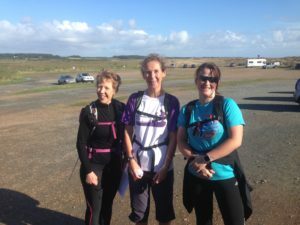 Happy to say it worked very well especially as when we set off Jayne just presumed we were doing the 26 miles…..
Once back on the 18 mile route the sun had decided to come out and greet us,and much fun was had as we found our way from check point to check point. Walking through the heath at this time of year with the heathers, grasses and boardwalks is really beautiful, the route ended with a stretch along the beach too, shame my battery died on my camera. The Marshalls at the checkpoints were all friendly and it was nice to see people I knew, the other fab thing about these LDWA challenge walks is the food, great food at every check point, then a bean and veg stew followed by crumble and custard when you finish. 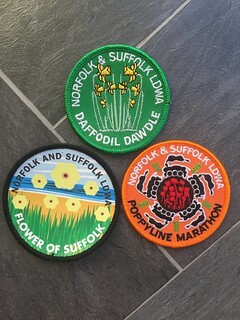 A really great day out with great company lots of chat and giggles…….. and I must make more of an effort to do more walking, next year we will try to do all 3 challenge walks, The Daffodil Dawdle, The Poppy line and The Flower of Suffolk. This entry was posted in Friends, LDWA, walking on October 3, 2016 by Sally. For the second year running I had arranged to do The Daffodil Dawdle 26.5 mile walk with my friend Gina. Its called a challenge walk as the route is not marked, your given 4 pages of route instructions and off you go…. last year there were so few walkers that we had to follow the instructions word by word. This year how ever there were many more walkers and with out realising it we just followed the walkers in front, which is not really a good idea because I never really knew where we were up to in the instructions. Over the 26.5 miles we had 3 check points where great food and drink was supplied at no extra cost, it was amazing to see the 100 or so people of all ages and sizes running the route and lovely to bump into other walkers I now know and have a chat on the way. The time just whizzed pasted in fact it felt more like an 8 hour chat with Gina than a 27.5 mile walk 🙂 and a great way to spend Mothers day. The only disappointment was that Geoff didn’t pop up in the middle of a field !! This entry was posted in LDWA, walking on April 4, 2014 by Sally. 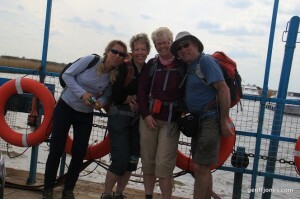 After walking the 12 miles from Downham Market to Kings Lynn along the Fen Rivers way. 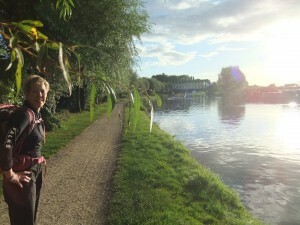 So last weekend I met up with my friend from the LDWA to walk the remaining Â 33 miles from Cambridge to Downham Market. We set off at around 7am, the path along the River Cam bustling with runners, with all the chatter we just flew along reaching Ely in no time at all, where we enjoyed tea and cake at Peacocks Tearooms. Finally 12 hours after setting off we arrived in Downham Market,10 hours of walking 2 hours of breaks and amazingly we kept a constant pace and never slowed down ! I was also told by another long distance walker that my blisters were badges of honour !! This entry was posted in LDWA, walking on September 13, 2013 by Sally. At the weekend @sallyinnorfolk was actually walking in Norfolk and what a walk it was! 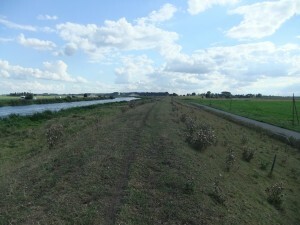 We tagged along with our LDWA friends to see just what we were made off, the plan was to walk theÂ Wherryman’sÂ way, which runs along the River Yare from Norwich to Great Yarmouth. The website says the route is 35 miles from train station to train station. As I was a little unsure about walking 35 miles and to make it easier for parking the car, we decided to start our walk at Whitlingham Country Park. So bright and early on Sunday morning in perfect weather conditions,we set off on our longest walk yet. I was amazed at how easy I managed the walk,walking with girls that chat all the time does make a difference and apart from a few sore toes I had no other aches. Not sure if the sore toes are from the new shoes, which had dreadful insoles with no cushioning at all, or just from the fact that I walked 34 miles. Next its the GEAR 10k run !! This entry was posted in LDWA, walking, Walking mileage on May 1, 2013 by Sally. On Sunday my twitter Friend Gina and I did the LDWA challenge walk known as the Daffodil Dawdle. Gina and I striding along.. I must confess to feeling very nervous about this walk, not because of the snow and not because of the distance but because this walk is not marked out, your given the route on the day. I had asked for the GPX file andÂ luckilyÂ for me late on Saturday evening IÂ received it in an e-mail, which opened perfectly into my viewranger app. All my worrying had been for nothing though, as the 4 pages of routeÂ instructions were very detailed and Â fun to follow,I only used the GPX file a few times just to double check we wereÂ actuallyÂ where we thought we were 🙂 I even had the confidence to tell some other walkers they were going the wrong way !!! All check points were perfectly spread out with food and a hot drinkÂ availableÂ at no extra cost too. will know we are addicted to our Fitbits and no way was Geoff going to let Gina and I clock up all those steps while he sat at home !! When checking in at the end,it was lovely to see Jayne who with other LDWAÂ membersÂ had hot soup, crusty bread, apple crumble and custard waiting for us. This entry was posted in Events, LDWA, walking on March 27, 2013 by Sally.